Scientists around the world are supporting a groundbreaking project that will significantly advance our understanding of neutrinos. One of the most intriguing mysteries in physics is the neutrino particle. While it is abundant throughout the universe (a billion times more abundant than particles that make up stars, planets, and people), little is known about them or their purpose. They are all around us and even inside us—right now a trillion neutrinos are streaming through your body. But what makes them extremely difficult to observe and understand is the fact that they almost never interact with any kind of matter or leave any trace. Some of the most basic questions about the properties of the universe could be answered by understanding neutrinos more completely. The recent discovery that neutrinos have mass could lead to greater understanding of matter, energy, space and time. In addition, neutrinos have the potential to reveal brand new physical processes that we have never observed before. In order to better grasp the potential of neutrino research, more than 1,000 scientists from 30 countries are collaborating on the Deep Underground Neutrino Experiment (DUNE). This project will involve massive construction, possibly beginning as soon as 2017, at both Fermilab and the Sanford Underground Research facility in South Dakota to create an environment that facilitates new experiments in neutrino science. 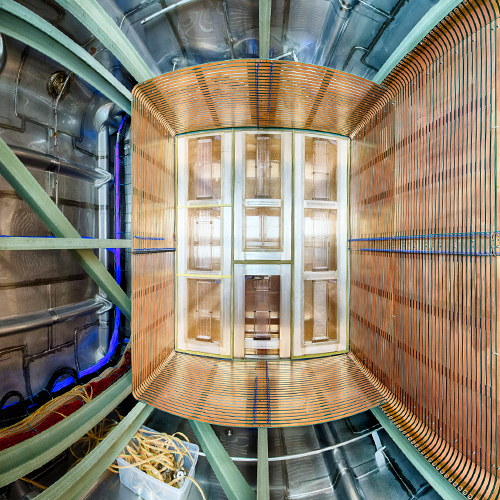 The proposed Long-Baseline Neutrino Facility (LBNF) at Fermilab would use the lab’s particle accelerators to create the world’s most intense neutrino beams and fire them at a neutrino detector at the Sanford Lab. Traveling at nearly the speed of light, the neutrinos would leave the Fermilab site at a depth of about 200 feet, continue straight through the earth and arrive at the Sanford Lab in South Dakota within a fraction of a second. Because neutrinos can travel through rock and all other matter, no tunnel would be necessary. Neutrinos change or oscillate as they travel, so scientists would closely study their properties at the beginning and end of their beamed journey. The experiment would measure neutrino oscillations to find out why we live in a matter-dominated universe. DUNE would also look for neutrinos that originate from the explosion of a star (a supernova) to discover the formation of black holes. In addition, DUNE would search for proton decay—particle interactions that would bring us closer to realizing Einstein’s dream of a grand unified theory of matter and energy. Learn more about DUNE and LBNF.